On the 1st October 2006, fire safety laws in England and Wales changed and the changes affect anyone responsible for non-domestic buildings. The emphasis is now on preventing fires and reducing risk and it is your responsibility to ensure the safety of everyone who uses your premises which means you are now required by law to carry out a fire risk assessment in your premises and act on the findings. This Law supersedes all existing fire certificates. The government has produced a series of guides for different business sectors. These guides will give you more information about how to carry out a Fire Risk Assessment. You can download the guides at http://www.communities.gov.uk/fire. At Action Alarms we will carry out a full survey of your premises using your Fire Risk Assessment to assess your specific requirements before designing a bespoke solution utilising the very latest systems and we will liaise with your local Fire officer and Insurance Company where necessary. We will be able to assist you in producing the Fire Risk Assessment document should you need it and offer comprehensive training to the “responsible person” as to their liabilities in the operation and maintenance of the Fire Alarm system. The Fire Alarm system shall be installed and maintained to the latest British and European standards (BS5839) with design, installation and completion certificates being issued. A 24hr 365 day emergency service with a maximum of a 4hr response is offered to all customers with a current maintenance contract. We will ensure the installation is sympathetic to its surroundings. We offer a comprehensive maintenance package for your Fire, CCTV or Security system which is vital to ensure that they remain effective and trouble free. This service is backed up with a 24 hour emergency callout facility where our fully qualified engineers are available to assist you with any technical support queries on the phone or remotely access you systems to ascertain the nature of the fault (where possible) and, if required, to attend site to resolve the problem. During a Maintenance visit the system is fully inspected within the guidelines set by British Standards and the National Security Inspectorate and a Maintenance Certificate is issued on completion. We offer a free no-obligation site survey booked by appointment so why not see how we can help you. 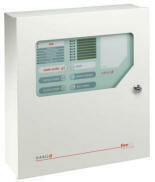 We offer all category of Fire alarms from M,P or L, type 1,2 or 3, grade A-F systems and is the system to inform the Fire Brigade or Audible only, allowing us to supply a package to suit every budget. We can also offer you assistance with all GAS Detection whether it is for the carbon monoxide from the boiler in the home or carbon dioxide detection and fixed oxygen monitoring systems for commercial situations.